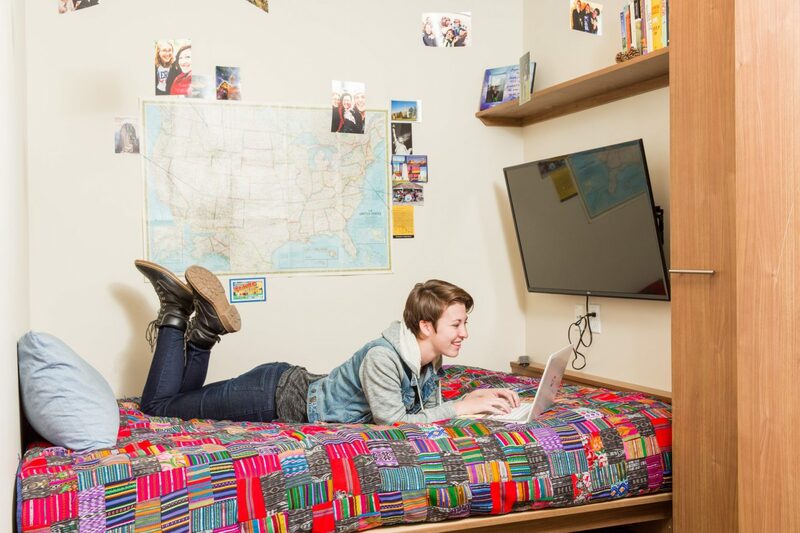 Housing & Residential Education strives to manage student applications and reservations in a timely fashion to help students who are on the wait list to be able to live on campus. We do not have enough housing in order to guarantee housing for all students. As we approach Move-In day, space in our residence halls and apartments continues to become more limited. If you desire to have your name added to the wait list in case a room becomes available please begin the application process and pay the $130 nonrefundable application fee as soon as possible. If you have already added your name to the wait list and have not received an offer we encourage you to explore other housing options as well as stay in communication with our office regarding your wait list status. To sign up for the wait list, please log into your Housing U account. Once you have logged into Housing U, enter the “Application” tab and select application term you are applying for. The wait list may be found within the housing application. The wait list is not room type or location specific; it works on a first-come, first-serve basis. The wait list is not for students that currently have a housing reservation. All wait list correspondence will be sent to your UMail account; be sure to check it for updates. If you sign up for the wait list and would like to be removed, please email info@housing.utah.eduor call 801-587-2002. All 2019-2020 Academic Year wait list updates will be sent to a student’s UMail address every Thursday. This web page will continue to be updated with wait list information. Housing & Residential Education, in an effort to provide housing to the maximum number of students possible, utilizes a priority system as part of our wait list management policy. Preference is given to individuals that have a University of Utah scholarship that offers housing, then international, out-of-state and out of area students first. Our wait list is then placed into groupings of applicants based on calendar periods and sorted by wait list registration time. Prioritization takes place within calendar groupings and not over the entire wait list. Place of residence (Utah based/non-Utah based) as provided by the University database. Date and time applicant registered for the wait list. Permanent room offers are based on cancellations and availability which makes it difficult to set an exact day when offers will be made. Depending upon availability, offers are typically made at the beginning or end of the week. All offer emails are sent to the applicant’s UMail account with details on how to reserve a space. Applicants are given a maximum of two offers and will have 72 hours to respond. If the first offer is not responded to, applicants will be moved to the bottom of the wait list. If the second offer is not responded to, applicants will be removed from the wait list and no additional offers will be made. It is HRE’s goal to house as many first-year students as we can. To help us in accomplishing this goal, sometimes we engage in a process called Standby Housing. Standby Housing is similar to a Standby Airline ticket: if offered a Standby Reservation you have a guaranteed space, but we can’t say when you will move into that guaranteed space or which space you will be moving into. If offered and accepting a spot into Standby Housing, you are signing a housing contract with HRE; if you cancel a Standby Housing contract, you will be subject contract cancellation fees. To those who will be affected by Standby Housing, please read through the the information below and review this sample Standby Housing Contract. HRE will be in consistent communication with those on the Wait List who have been offered a Standby Housing reservation. Please check your UMAIL frequently. Q: Can you tell me my wait list number? We are not able to provide exact numbers to students on the wait list because we give priority to out-of-state and international students. This does not mean that in-state students will be placed at the bottom of the wait list or not offered housing. Since we are adjusting the wait list to reflect this priority, an exact position on the wait list is not something we can provide. Q: How will I be offered a room? You will most likely be offered a standby room first. A standby room is a guarantee for a room on campus. A student will make a reservation in a standby room and complete it by choosing a meal plan and paying the reservation fee. You will be contacted via your UMail and personal email when this has been offered to you. If you are placed in an apartment or area where a meal plan is not required, it may be cancelled at that time. Once a permanent space becomes available, the student will be contacted and moved from their standby space to their permanent room. Their reservation will be complete at that time. We do anticipate cancellations over the course of the summer, but especially around May 1, June 1, and July 15. We will have a better idea of how many cancellations we have received and what students are still on the wait list at this time. Also, students are currently waiting to hear back about Living Learning Community (LLC) placement, which will open up additional spaces when LLC students are moved from their current room to an LLC room. Q: What is Standby Housing? As we get closer to Move-In day, on-campus housing will become more limited. Housing & Residential Education will be identifying numerous temporary housing options for individuals on our Wait List. These temporary spaces are located in the Guest House (our on-campus hotel).